The northern yellow bat, Lasiurus intermedius floridanus, is the second largest bat in Florida after the mastiff bat. It is commonly called the Florida yellow bat, the eastern yellow bat, and the big yellow bat. It is 4 to 5 inches in length and weighs less than one ounce. It has silky fur which ranges in color from yellowish-orange to yellowish-brown to almost gray. The fur extends down the body to cover about half of its tail membrane. Its wings are fairly long and its ears are relatively short. It is a very beautiful bat. The northern yellow bat is found along the Atlantic and Gulf coastal plain from South Carolina to southeastern Texas. It is found throughout Florida. It roosts in clumps of Spanish moss and occasionally the old fronds of cabbage palms. It is most abundant in sandhill and xeric live oak hammocks. It is generally a solitary bat. However, small groups have been reported roosting together in the skirts of old fronds of cabbage palms. Its diet consists entirely of insects. It forages for these insects over open areas such as fields, pastures, airports, golf courses, marshes, lake borders, and open savannas. Breeding occurs in the fall. However, the female stores the sperm and fertilization is delayed until the spring. The gestation period is only a few weeks. The pups are born during May and June with the litter consisting of two to four pups. The female leaves the pups in the roost while she goes out to forage. However, if the roosting site is disturbed she will carry them with her. The young are able to forage for themselves within two to five weeks. Northern yellow bats do not migrate, but rather go into a state of torpor when the weather is harsh or food is not abundant. During torpor they rely on their store of body fat to sustain them. The northern yellow bat is listed as ‘status undetermined’. It is suspected of falling into the categories of endangered, threatened, or rare, but there has not been sufficient data collected to provide an adequate basis for assignment to a specific category. 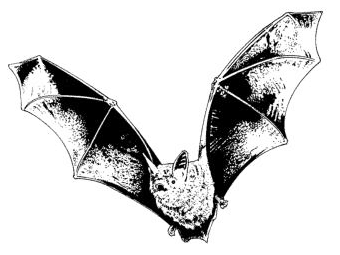 Loss of habitat and the use of pesticides are the main threats to this sub-species, as well as all other bats in Florida. The clearing of woodlands and the practice of removing old palm fronds and Spanish moss kills many individuals and depletes roost sites. The use of pesticides causes considerable harm to bats, as well as other living creatures. Pesticides are stored in the animal’s body fat and become increasingly concentrated when body fat is depleted during lactation, torpor and food shortages. Young bats are particularly susceptible to pesticide poisoning, which they come in contact with through environmental exposure and their mother’s milk.